We managed to leave Oktoberfest at 8pm because we knew we had an early flight to Istanbul the next day. We planned 4 days of chilling out and wandering around exploring this fascinating city. Within an hour of being in the city, I was hooked. Why was that? We arrived just in time for evening prayers – a clear voice sings the prayers on loud speakers outside the mosques all over the city. It was beautiful and soothing. It set the tone for what was a really enjoyable trip. 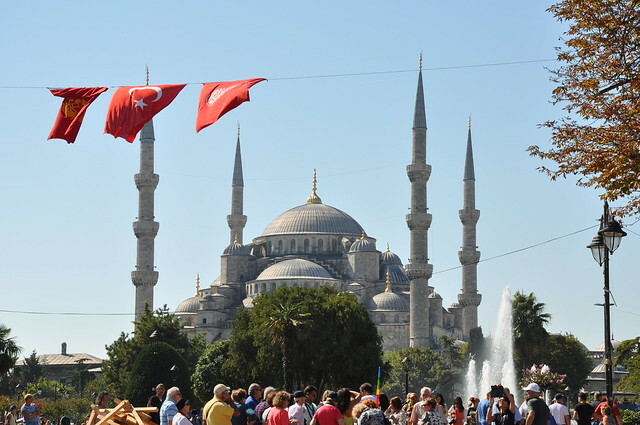 This mosque is called the Sultan Ahmed Mosque has one main dome, six minarets, and eight secondary domes. 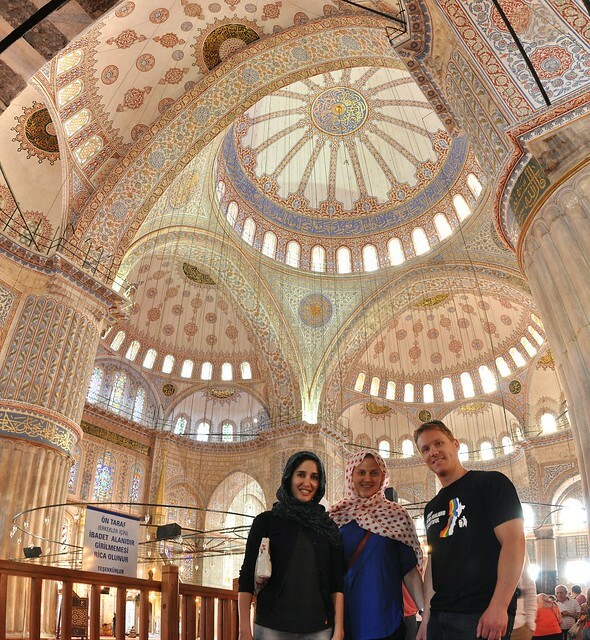 It’s more commonly called the Blue Mosque because of the blue tiles on its interior. 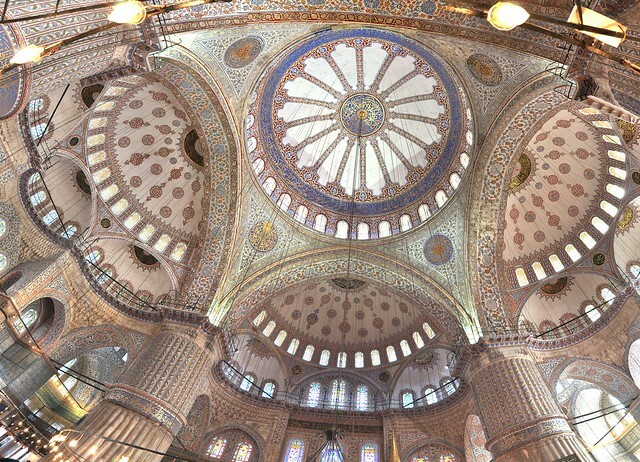 It was built by Sultan Ahmet I between 1609 and 1616 and is still a working mosque today. Tourists can only visit between prayer times. Everyone has to wear pants long enough to cover your knees (we were all sweltering in our jeans…) and women’s shoulders and hair have to be covered. We look quite the part! 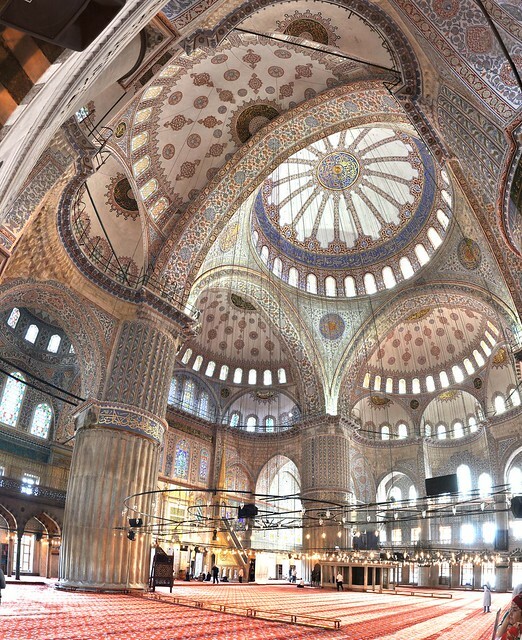 The interior of mosque is stunning. 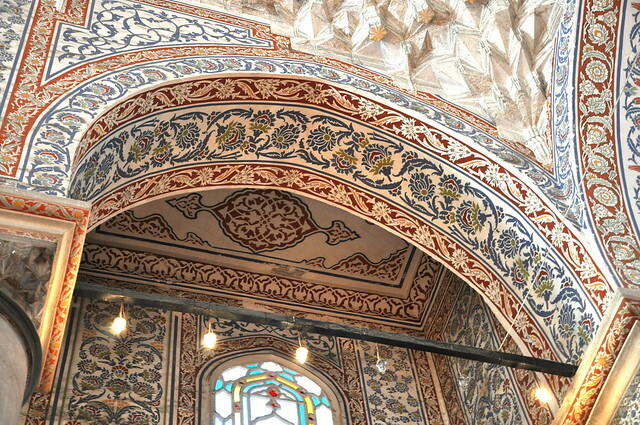 It features thousands of blue iznik tiles that form over 50 different tulip designs all over the walls and ceilings. What a huge and beautiful space. Rob and I have visited so many cathedrals since we’ve been in Europe, but never has there been a really sense of beauty and artistic design to their interiors (the exception would be La Sagrada Familia). I just loved all the colour and the massive chandelier in the centre. 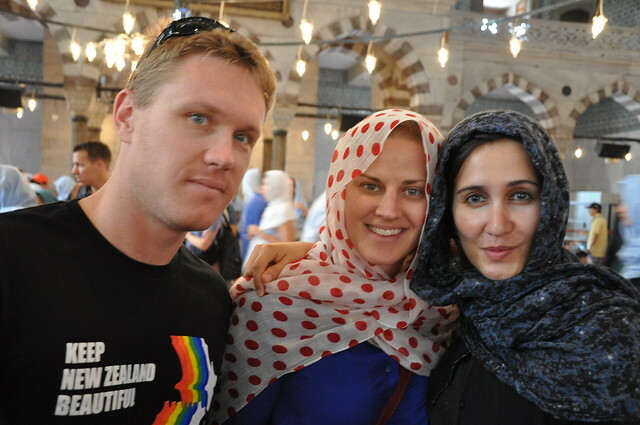 We loved this mosque, and apparently there were more beautiful ones elsewhere in the city! We’ll have to go back to Istanbul to see some of the others in the future. 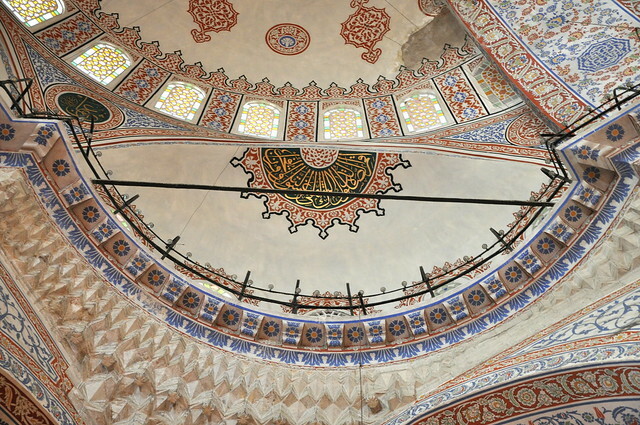 We’ve got a few blog posts coming about our adventures in Istanbul – exploring the architectural masterpiece that is Aya Sofya, bargaining in the bazaars, wandering an underground cistern, wandering Topaki Palace where generations of sultans (and their harem) lived and cruising the Bosphorus strait between Europe and Asia. 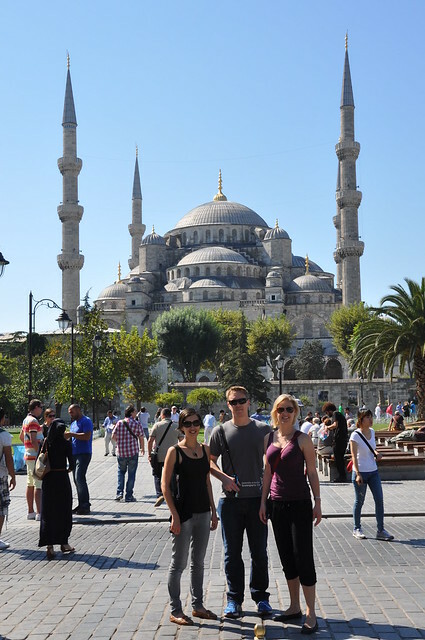 Istanbul was amazing, but we’ll let the next blog posts tell you that.